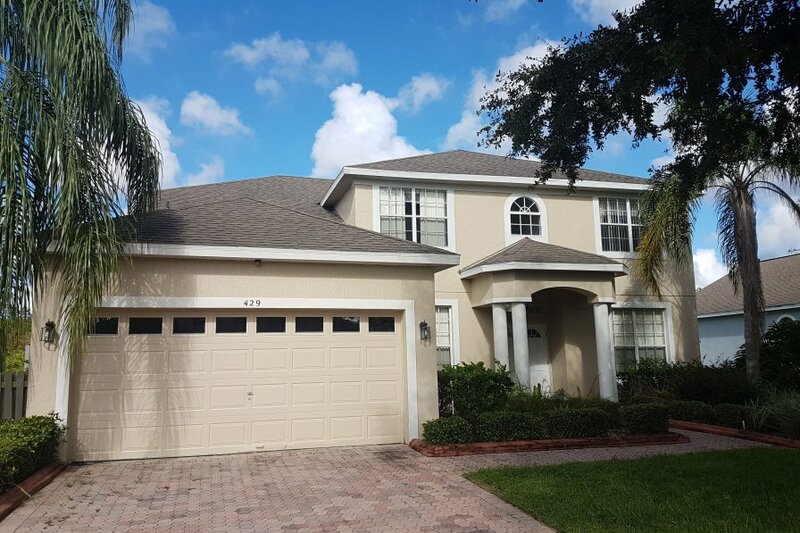 Our luxurious 5 bedroom 3 bathroom two story villa is located on Highlands Reserve Golf and Country Club just off the I27 and 9 miles from Disney-world main gates. Within a 10 minute walk there is Berry town center with a range of shops, restaurants and supermarkets. The villa itself sleeps a maximum of 10 people with 3 double rooms and two twin rooms with the master suite having a large en-suite. Each of the bedrooms have TV's. The downstairs is open plan and has a formal dining area, media room with corner sofa and TV entertainment system. The main living area open out to the kitchen which has stainless steel appliances and granite worktops and there is a breakfast table and chairs. It's a bright room due to the large windows and doors. Downstairs there is a family bathroom with a door leading to the patio area and a double bedroom. The garage has been turned into a games room with a pool table and Foosball table. The outside space is fantastic with a large pool and plenty of seating for those lazy Florida afternoons and evenings. Being West facing it gets the sun of an afternoon and it's not overlooked as we back on to conservation area. The villas either side aren't too close so there's no feeling of being penned in.